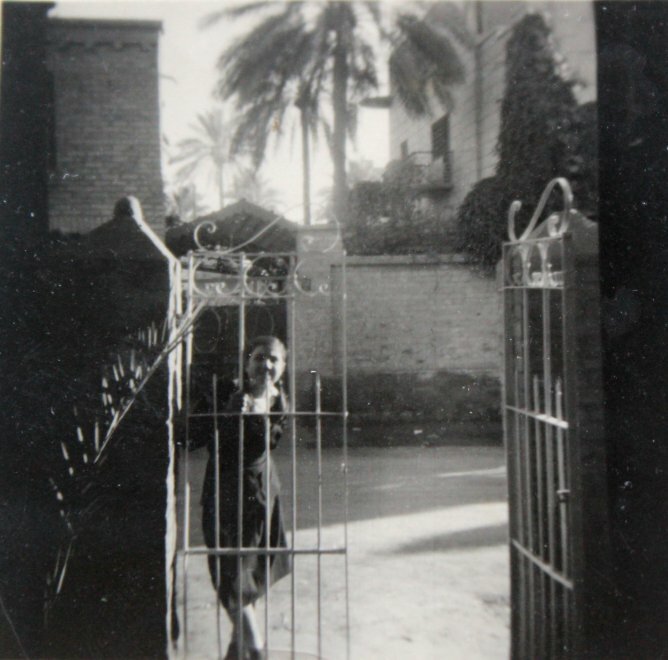 Mrs. Pearl at the gate of her family’s home in Betaween. Ruth (née Rejwan) Pearl was catapulted to international prominence after an atrocity: the kidnapping and brutal murder of her son Daniel while he was reporting for the Wall Street Journal in Pakistan. Less well known is a mass atrocity Mrs. Pearl witnessed as a child growing up in Iraq: the FarhudFarhud (Arabic: الفرهود‎) refers to the pogrom or "violent dispossession" carried out against the Jewish popula..., the June 1941pogromA pogrom is a violent riot aimed at massacre or persecution of an ethnic or religious group, particularly one aimed at J...st pogrom in downtown Baghdad during which as many as 180 Jews were killed and hundreds more were injured. To mark the 72nd anniversarFarhudFarhud (Arabic: الفرهود‎) refers to the pogrom or "violent dispossession" carried out against the Jewish popula...he Farhud, Diarna (“Our homes” in Judeo-Arabic) presents a preview of an exclusive interview recently conducted with Mrs. Pearl about her childhood home in Baghdad and what she saw during the Farhud. In the full interview, she also described memorable sites from her childhood, such as attending the Alliance Israélite Universelle Girls School, going on pilgrimage to the traditional Tomb of Ezekiel at al-Kifl, and moving to the suburb of Betaween. Watch Diarna’s exclusive preview clip of the interview with Mrs. Pearl (a full version will be released later). Mrs. Pearl was born into a family with roots in Iraq that likely date back before the advent of Islam. Her father, Joseph, owned a successful import business and tailory atelier on the bustling al-Rashid Street. Her mother, Victoria, was a homemaker and talented tailor in her own right, creating suits and dresses for the family. The Rejwan family home was near city centre, on the corner of an alley off al-Rashid, in a predominantly Muslim neighborhood. Mrs. Pearl fondly recalls how her non-Jewish neighbors “would try to feed me – which is not kosher and I’m not supposed to – but I’m sure they convinced me once or twice. They liked me because I spoke their dialect” of Iraqi Arabic, which differed from the variant spoken by Jews. 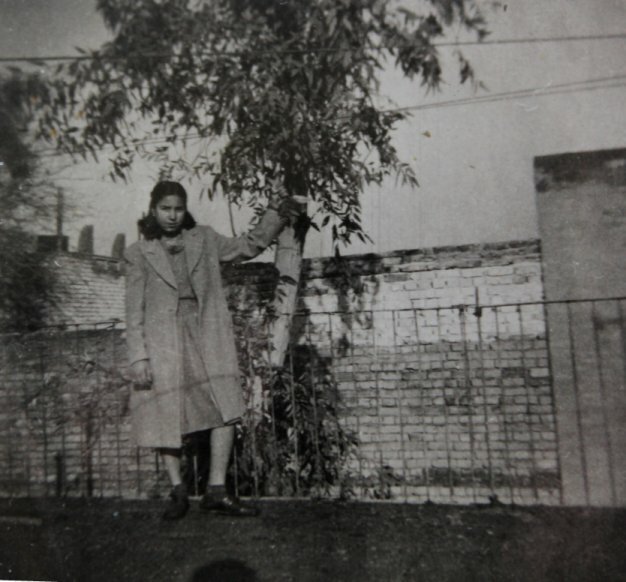 Mrs. Pearl with her favorite eucalyptus tree on the roof of her family’s home in Betaween. Mrs. Pearl remembers her father rushing family members one-by-one to the cellar – and forgetting his cigarettes in the process. She volunteered to retrieve them and was permitted to do so on the condition that she did not look outside the windows. “Tell a six years old don’t look… of course I looked,” she recalls, “And I went to the window and saw the injured guy [a looter] moaning, and none of the Muslim neighbors really helped him. But I never told my parents about it… because I figured I broke the law and I don’t want to be punished.” Due to her fluency in the dialect and dark complexion, Mrs. Pearl was the only member of the family able to shop at the market amidst the chaos.